Detection of the device type in /dev directory is pretty simple. Symbol C in the beginning means that this device is a character device. Also you can find here two strange numbers: 4 and 64. This is a Major and Minor numbers of this device. 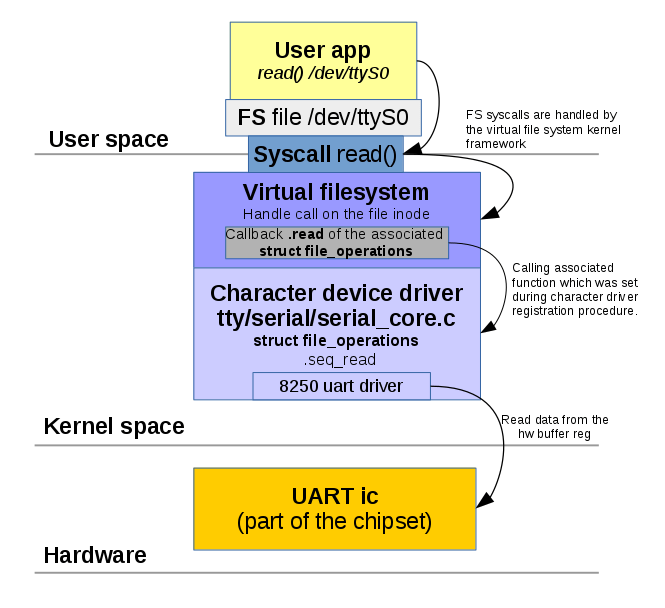 Inside Linux kernel every device is identified not by symbolic name but by unique number – major number of the device. This number assigning by the kernel during device registration. Every device driver can support multiple “sub-devices”, for example serial port adapter may contain two hardware ports. Both of this ports are handled by the same driver and they shares one Major number. But inside this driver every of this ports is also identified by the unique number, this is a device Minor number. One Major number 4 for every ttySX device and different (64–65) Minor numbers. Minor numbers are assigned by the driver’s code and developer of this driver may select any suitable values. As this device acts like a file – programs can do almost everything except seeking. Every file operation on this object it’s a command to driver to do something inside Linux kernel, start reading some data from hardware, for example. In the end of this article you can found complete example of the character device driver, but first let’s discuss how it works. Diagram below shows how user space program interacts with the IBM PC serial port using character device. Virtual filesystem is an abstraction layer on top of a more concrete file system. The purpose of a VFS is to allow client applications to access different types of concrete file systems in a uniform way. In case of special device files VFS is responsible for calling I/O functions set by the device driver. To set this functions special kernel structure is used. Some operations are not implemented by a driver. For example, a driver that handles a video card won’t need to read from a directory structure. The corresponding entries in the file_operations structure should be set to NULL. In a C99 way initialization is simple. Initialized file_operations can be assigned to character device during device registration. Registration procedure consists of several simple steps. First you need to decide how many minor devices you need. This is a constant which typically depends on your hardware (if you writing driver for real hardware). Minor numbers is convenient to use as part of the device name. For example /dev/mychardev0 with a Minor 0 /dev/mychardev2 with a Minor 2. First step is an allocation and registration of range of char device numbers using alloc_chrdev_region. Where dev is output parameter for first assigned number, baseminor is first of the requested range of minor numbers (e.g. 0), count is a number of minor numbers required and name – the name of the associated device or driver. The major number will be chosen dynamically, and returned (along with the first minor number) in dev. Function returns zero or a negative error code. To get generated Major number we can use MAJOR() macros. Now it’s time to initialize new character device and set file_operations with cdev_init. struct cdev represents character device and allocated by this function. Now add device to the system. Finally – create device file node and register it with sysfs. You can find few new things in this example. Creation of the sysfs class is a necessary part of the device node creation. Sysfs can be used as additional way to interact with user space. Setting up some driver params, for example. Another useful thing – configure UDEV variables to set up correct permissions to the character device. This can be done by setting uevent callback to sysfs class. Now we got “rw-rw-rw-” permissions on the every mychardev. Every user can read and write. When character device is no longer required it must be properly destroyed. To give ability to interact with your device file we need to set few functions to the struct file_operations. Now we can handle I/O requests. To transfer some real data within read/write requests we need to use special kernel functionality. It’s very dangerous or even impossible to do simple memory copying using *buf pointers. This functions performs additional checks of the permissions and memory regions before actual data access. It’s always important to check how many bytes user want to read. If this size is exceeds actual size of the prepared data – user can read the kernel stack what can be a hole in the system security. Now let’s try to read 29 bytes from the our character device. Hello from the kernel world! Of course we can send to the user space not only strings but any other raw data, structures. It’s also very important to verify how many bytes sending user and how many bytes we can accept. Function copy_from_user returns number of bytes that could not be copied. On success, this will be zero. You may ask how to identify which device (mychardev-0 or mychardev-1) is used in a concrete I/O process? Since our Minor numbers is the same as device names we can get Minor number from the file inode using struct file. Let’s print this value in the read and write functions and see what happens. This is a utility function used to pass some CMD as number and some optioanl data as ARG. You need to define some magic numbers which will be used as CMD (and probably as ARG) somewhere in a separate header file, shared between driver code and user application code. Then all implementation of the ioctl function is a simple switch case routine where you doing something depending on sent CMD. Now complete example of the Linux kernel module which implements everything that we were discussed here. And Makefile to build this code. Now you should find two new devices: /dev/mychardev-0 and /dev/mychardev-1 and repeat all experiments from this article. This code can be used as basic pattern in some more complex driver project. Next Next post: Autonomous Allsky camera with Raspberry PI. Part 1: overview.